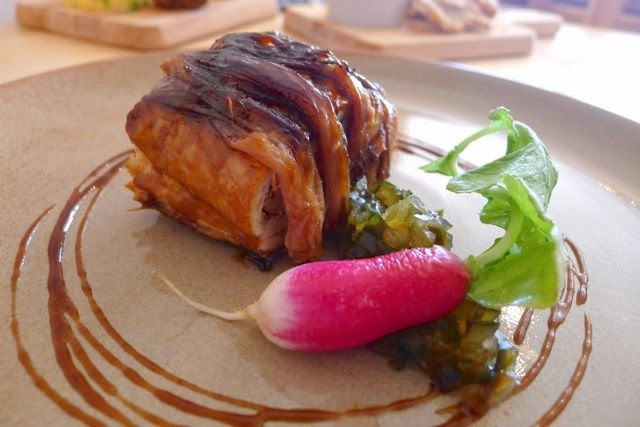 Albion, as I’m sure every blog post and review you’ll read about the latest project from Chef Steven Burgess will tell you, is the oldest name for the island of Great Britain. 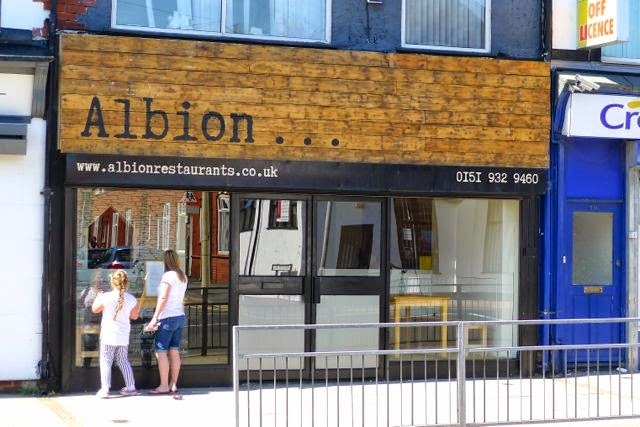 Based in a former retail unit in Crosby (near Liverpool), at first, Albion may not be exactly what you would have expected from the chef who made his name as the ‘food director’ of Camp & Furnace. Whereas Camp & Furnace is very “now” and “on trend”, Albion cites itself as being an ‘old British’ restaurant – the menu descriptions include dates from original versions of the dishes; with much of the menu based on recipes from the 18th and 19th centuries. A lot of research and work has clearly gone into writing a refreshingly different, yet familiar, menu. 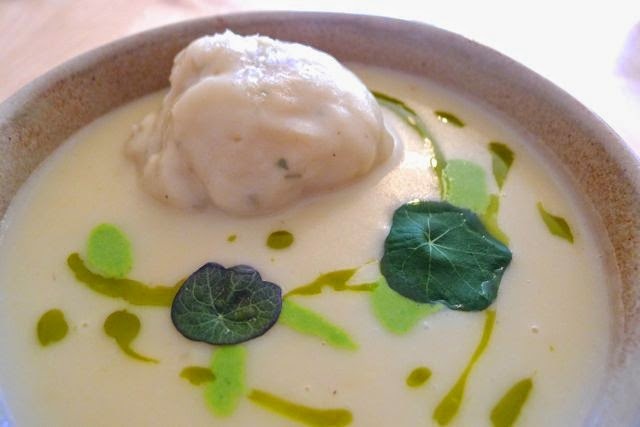 Deciding to embrace the ‘historical’ concept, I selected the oldest dish on offer, a ‘Local potato potage with onion dumplings and sorrel oil’, dating from 1175! It was perhaps not the best thing to choose on a warm summer’s day but the citrusy sorrel oil and cloudlike dumpling made the dish lighter than it could have been. 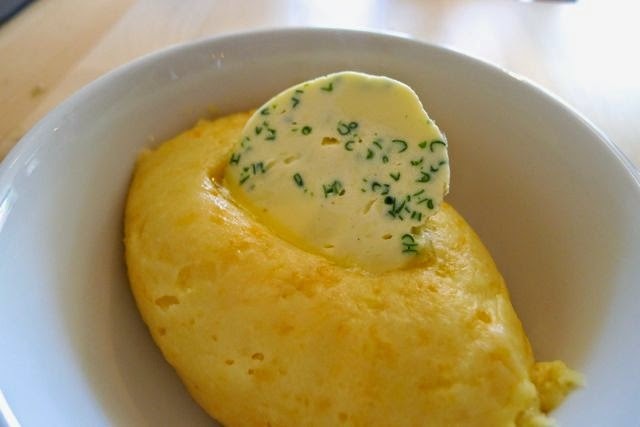 Prior to the soup I had some dinky ‘Beer bread cooked in hay with English mustard butter (1700)’ - I loved the presentation and the butter but found the glaze on the bread a little too sweet for my taste. 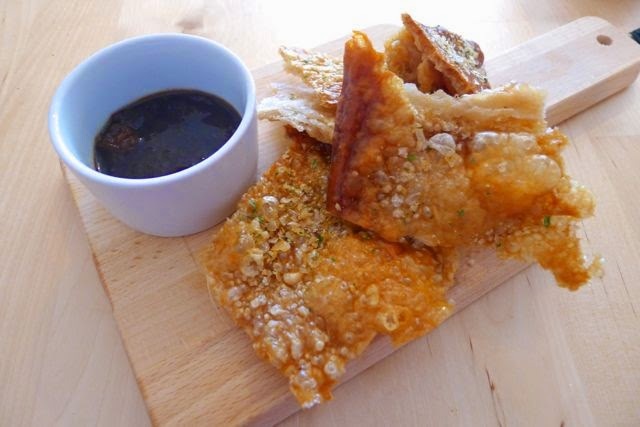 My other appetiser of ‘Pork dustings with sticky Gentleman’s relish dip (1846)’ was a joy. I’d talk about the smack of of ‘umami’ from the relish if it didn’t make me sound like a “proper divvy” (as they say in those parts). In 1929, the Wall Street Crash saw the start of the Great Depression. It wasn’t all doom and gloom though because it seems that in the same year someone invented ‘Cumbrian mutton & treacle bacon turnover with cucumber chutney’. This was a lovely thing… the puff pastry delightfully gooey from the treacly glaze. A little more of the cucumber chutney would have helped to add the extra bit of moisture I felt the dish needed. 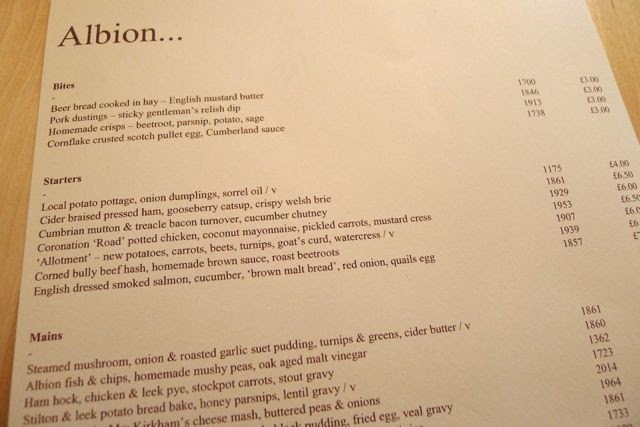 For my main, it was back to 1362 for a ‘Ham hock, chicken & leek pye with stockpot carrots and stout gravy’. 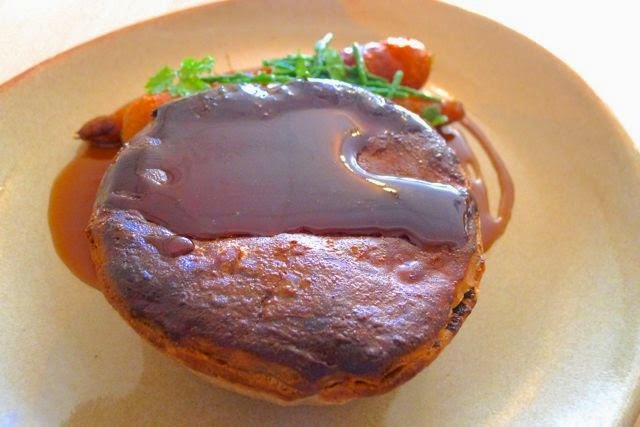 Although pies (Wikipedia tells me), first, ‘appeared around 9500 BC, in the Egyptian Neolithic period’, since they were brought to our shores by the Romans in AD43 they have been popular with the people of Britain, especially those in the north. 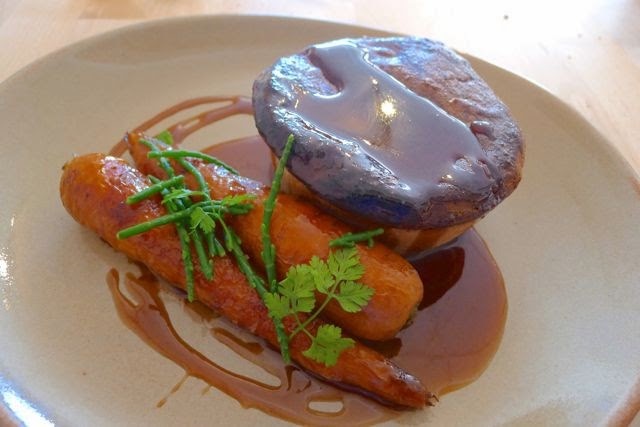 I’m sure this hearty, steaming blend of crisp pastry, generous meaty filling and rich stout gravy would have won over even the most dogged of Brigantes. The carrots, topped with a bit of salty samphire, were pretty special too. 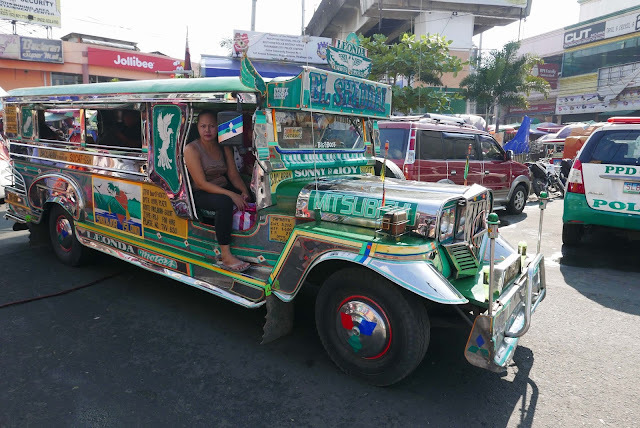 Having chosen quite hearty dishes (after a big breakfast), coupled with the generous portions, I was too full for dessert but have vowed to go back soon with my wife for the complete experience. 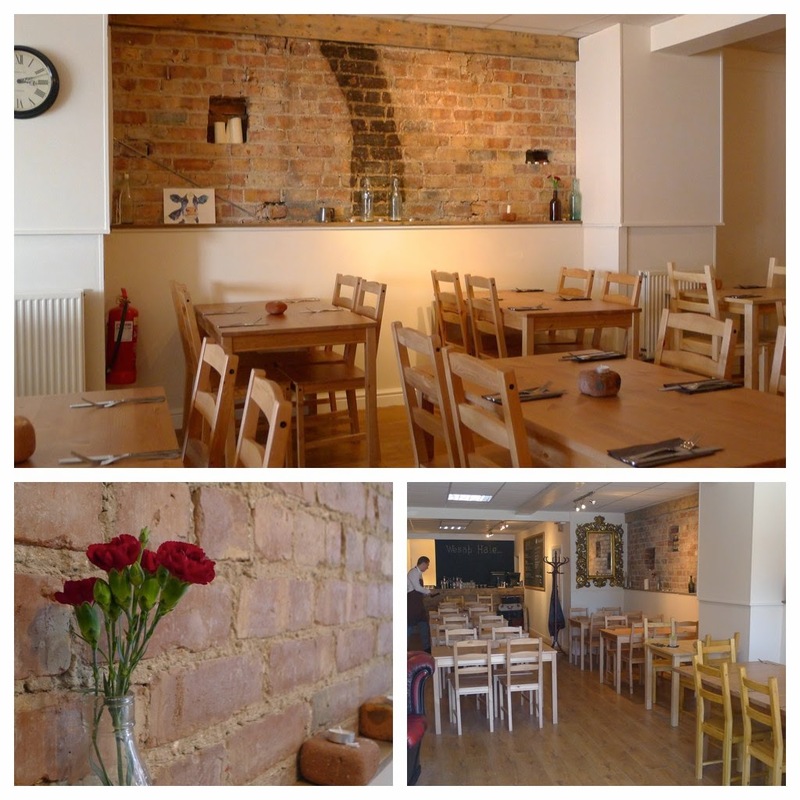 It’s early days for the restaurant grounded in history but it’s future is looking good. For better pictures of some of the dishes and more, check Bacon on the Beech. 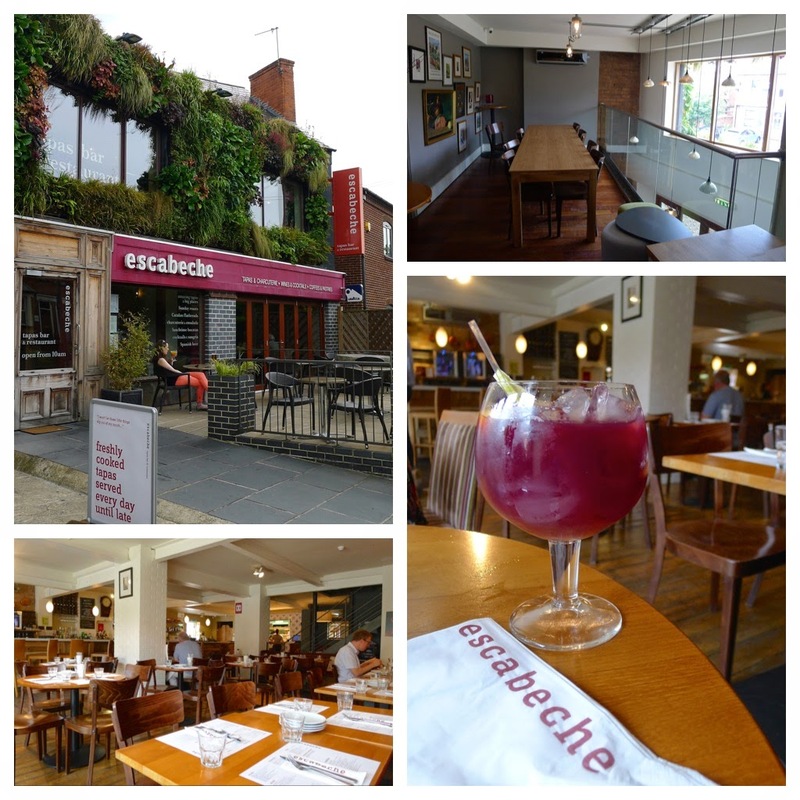 After such a good experience at Ibérico World Tapas (see here), I thought we should check out Escabeche – both serve tapas, both are in Nottingham and both have a listing in the Michelin guide. One downside of visiting the two places one day apart was finding it difficult not to make direct comparisons, which is slightly unfair as, despite similarities, are also very different – to my mind, of the dishes we had ‘like for like’, Ibérico World Tapas served the better croquettes, patatas bravas and jamón. If I were to recommend one place other the other it would be IWT – this should not take anything away from Escabeche, which we I still thought was very good and way better that the tapas places in my hometown of Manchester (although I am yet to try the ‘new’ Levanter Fine Foods in Ramsbottom). 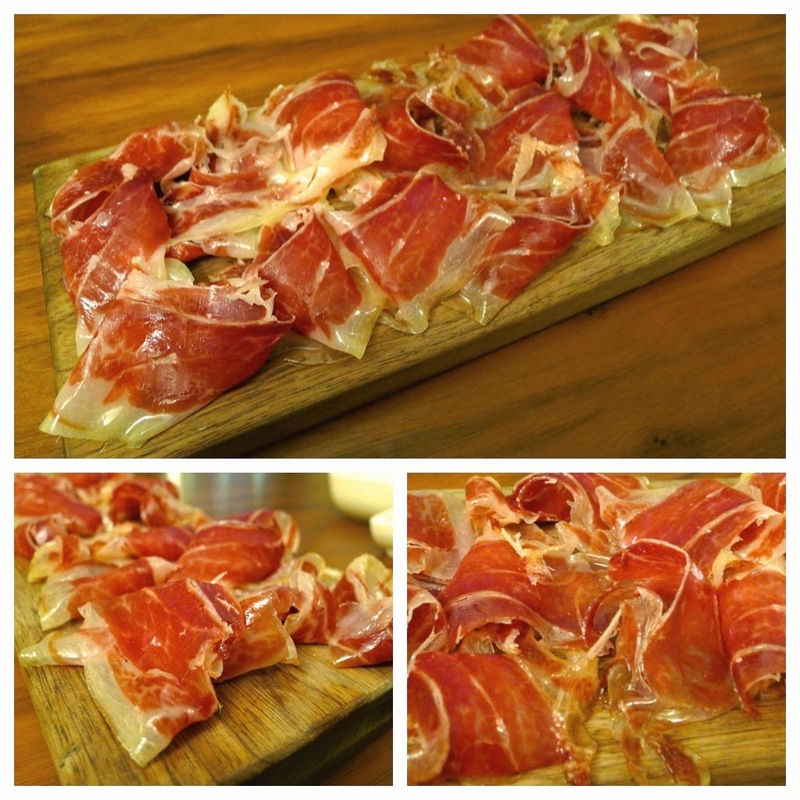 Jamón de Teruel D.O., 18 month aged, Serrano ham – another quality ham, not quite in the league of the ‘Ibérico de Bollota Reserva’ we had at IWT but this is also reflected in the price. The accompaniment of shaved pickled fennel and caper berries was a delight. 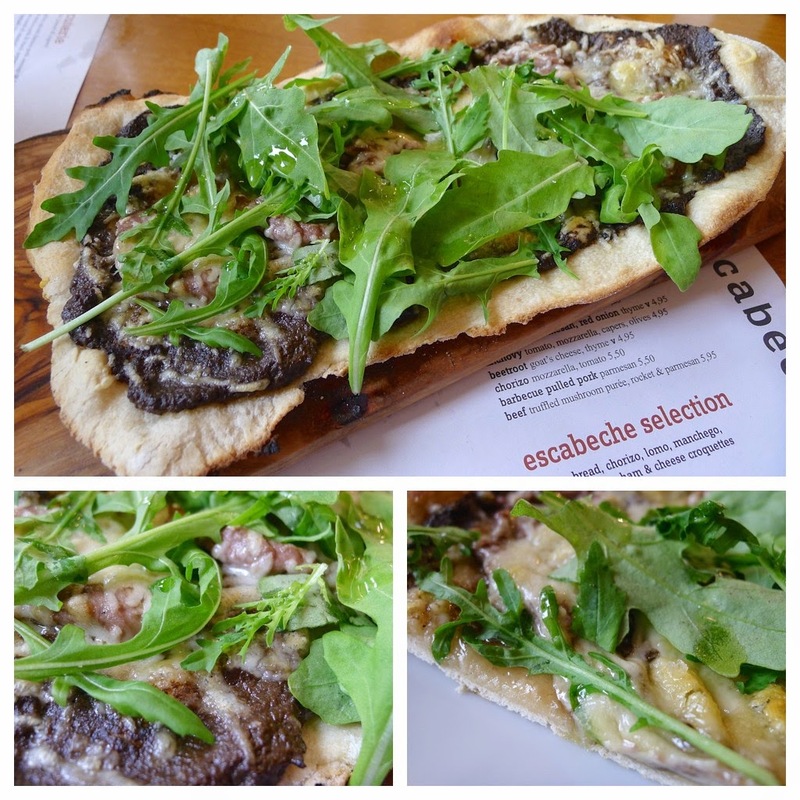 Beef Cocas, Catalan flat bread with truffled mushroom purée, rocket & parmesan – Escabeche serve several of these Catalan stone baked flatbreads with a choice of several different toppings; this one had just the right amount of truffle oil for our taste. Poached smoked haddock salad, harissa slaw, pickled beetroot, apple & toasted walnuts – a simple, fresh tasting dish with lovely textures and flavours. Mackerel escabeche, lime cured fillet, cucumber, garlic mayonnaise & flat bread – another good dish awash with good flavours; the fennel seeds adding a surprise and welcome addition to the menu description. 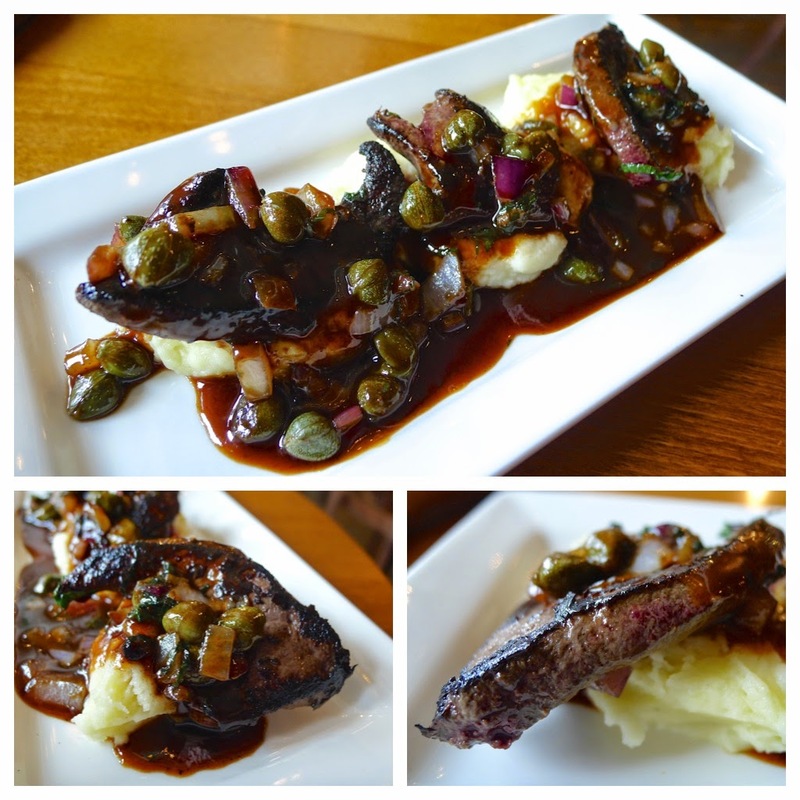 Seared calf’s liver, creamed potato, red onion, caper & mint jus – this was one dish that did not quite deliver on flavour as expected; the ingredients and look suggested something more punchy and robust. 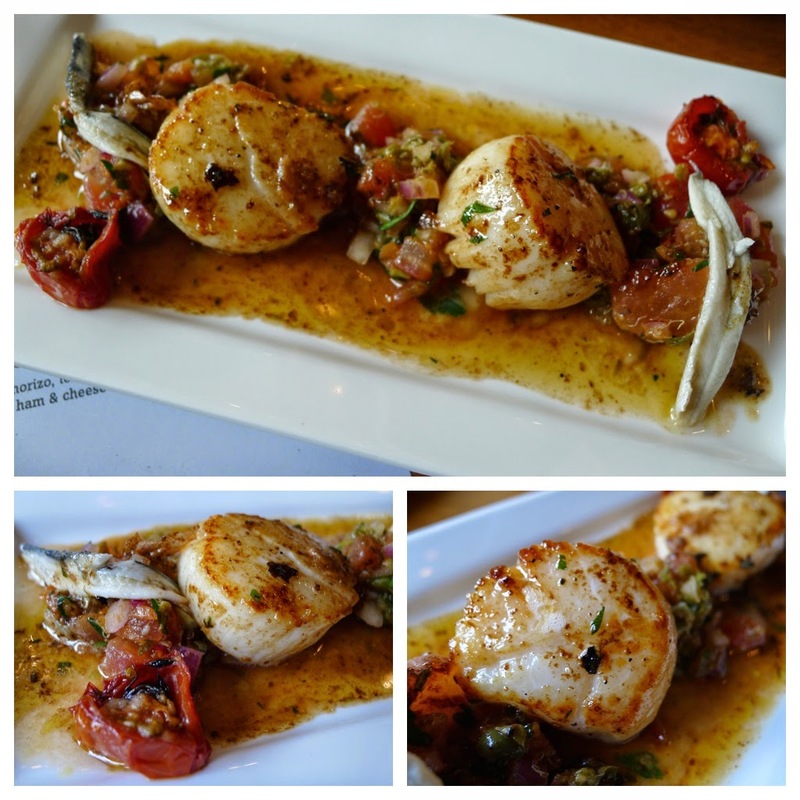 Seared king scallops, anchovy butter, tomato salsa – the scallops were well cooked (Who can’t cook a scallop these days? Used to be the case that they were often overdone. Less so these days, I’ve noticed.) 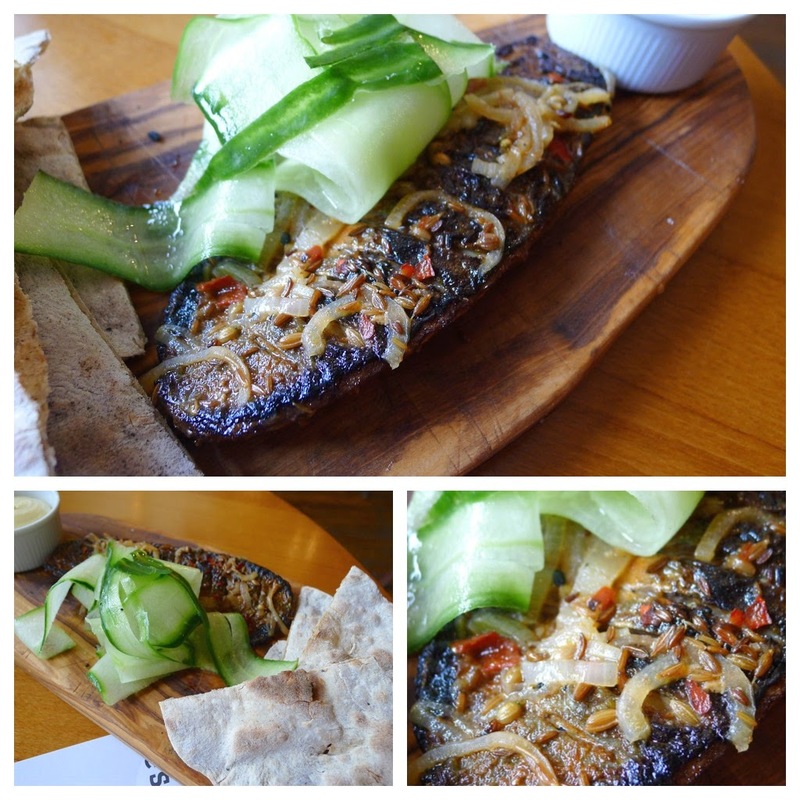 but it was the anchovy butter that I loved… delicious Mediterranean flavours. 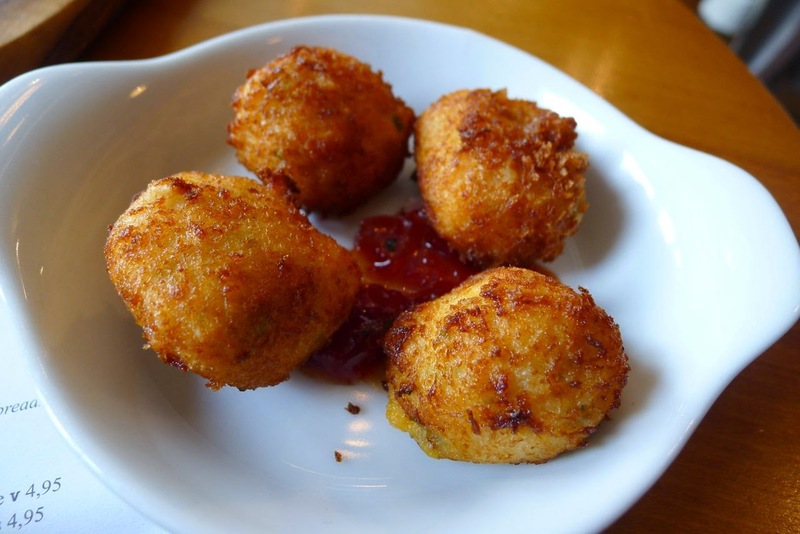 Salt cod & chorizo croquettes – decent croquettes with good strong flavours. 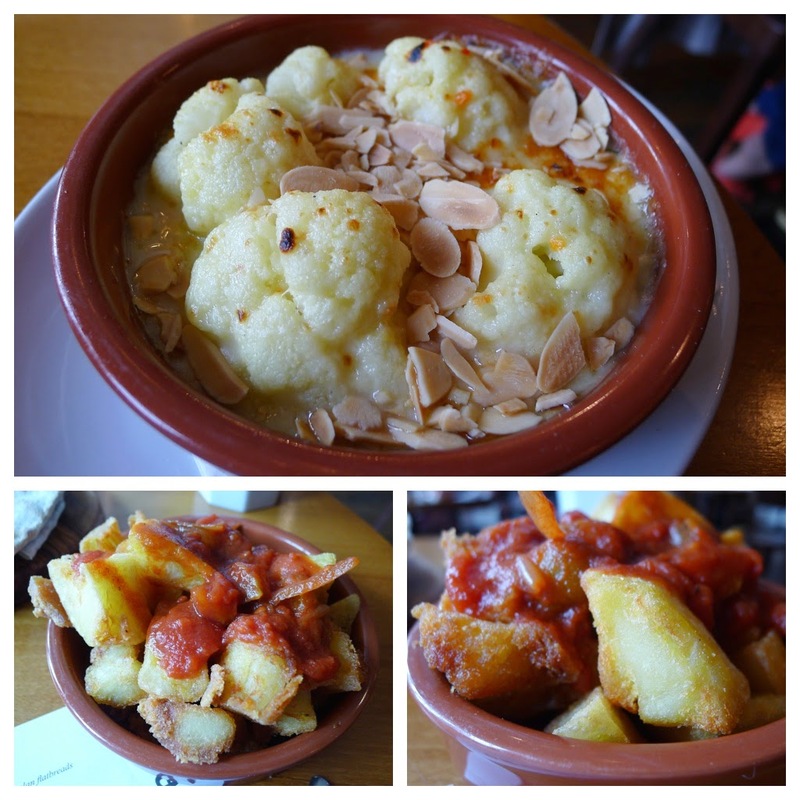 Escabeche cauliflower cheese, toasted almonds, chilli flakes – Patatas Bravas – delightfully crispy potatoes. 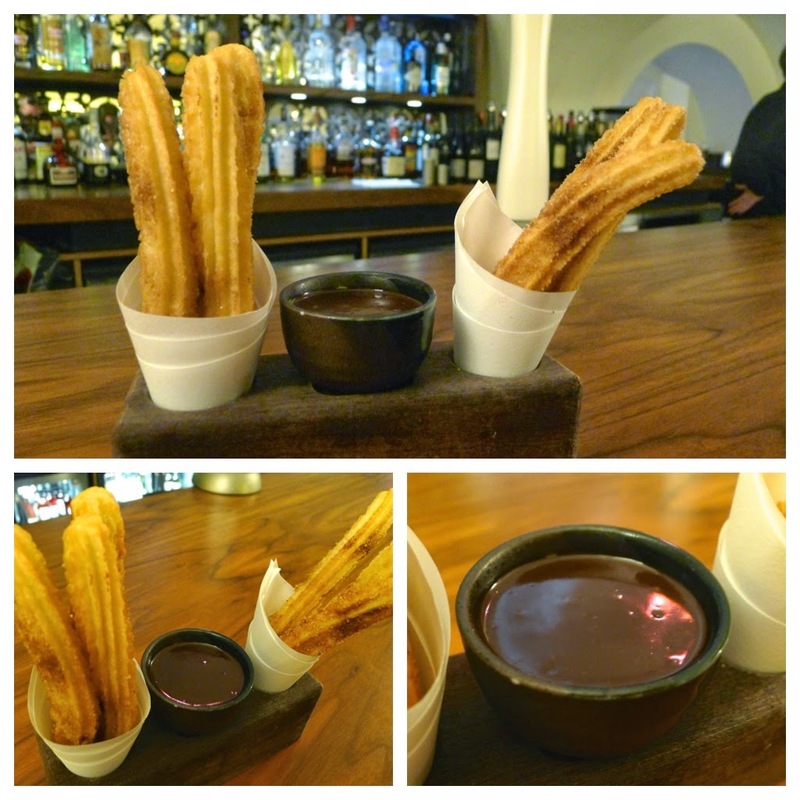 Churros – Spanish doughnuts with chocolate sauce – the chocolate sauce was a little thin for my liking. 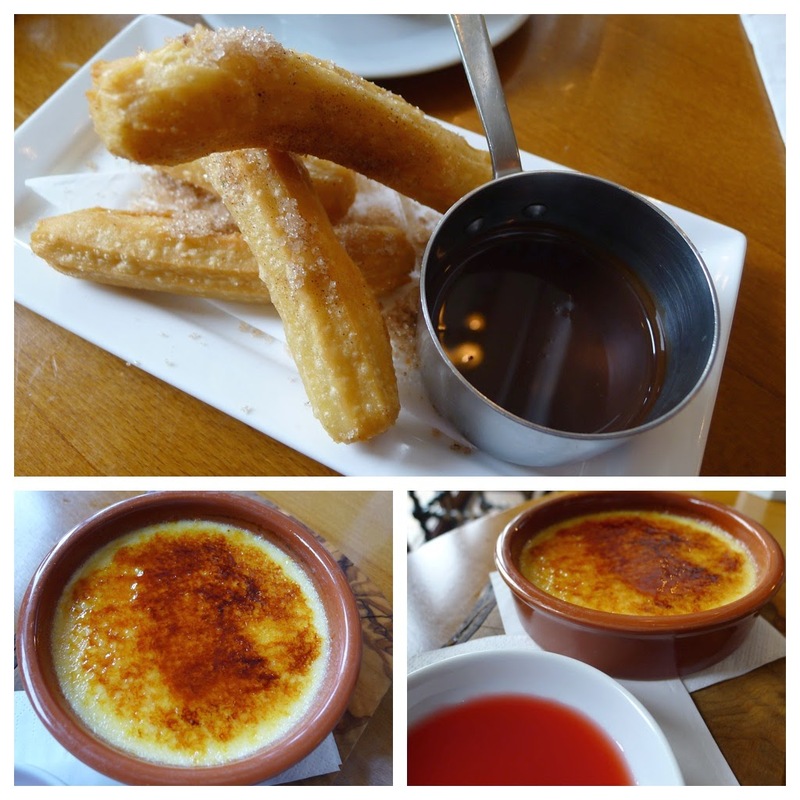 Crema Catalana, blood orange coulis – my wife was very happy with her Crema Catalana… one of her faves. 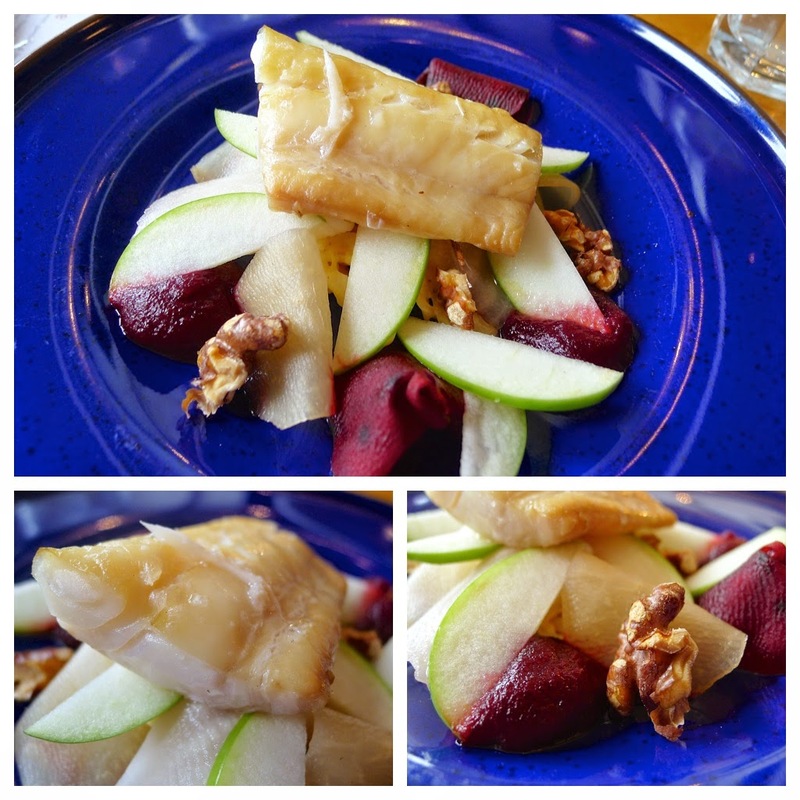 Escabeche is a great place – good service, good tapas and good ambience. The people of Nottingham are spoilt. 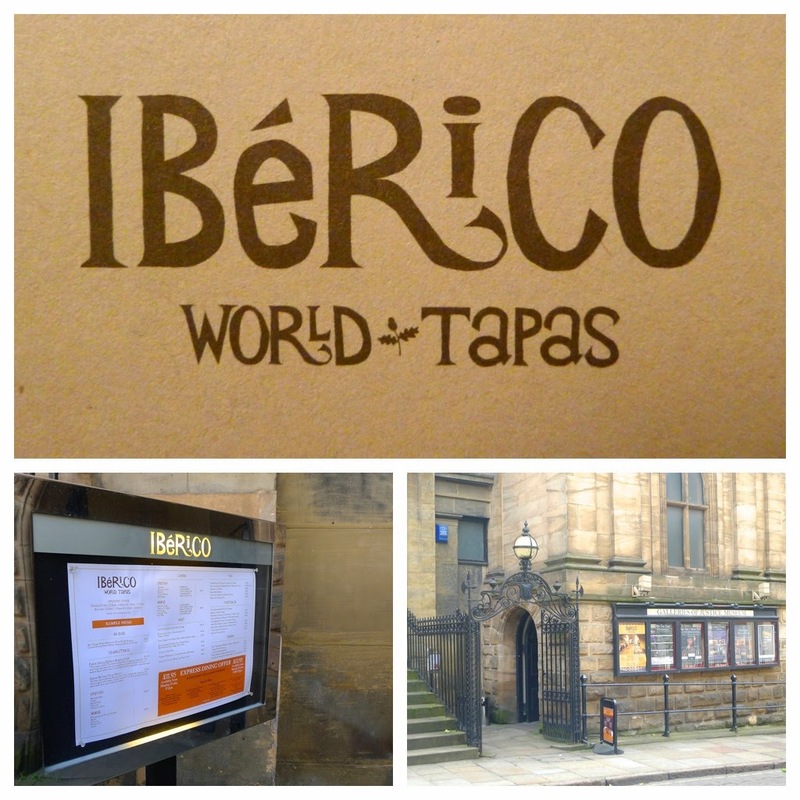 Ibérico World Tapas is an atmospheric subterranean tapas place in Nottingham that currently boasts a Michelin “Bib Gourmand”. 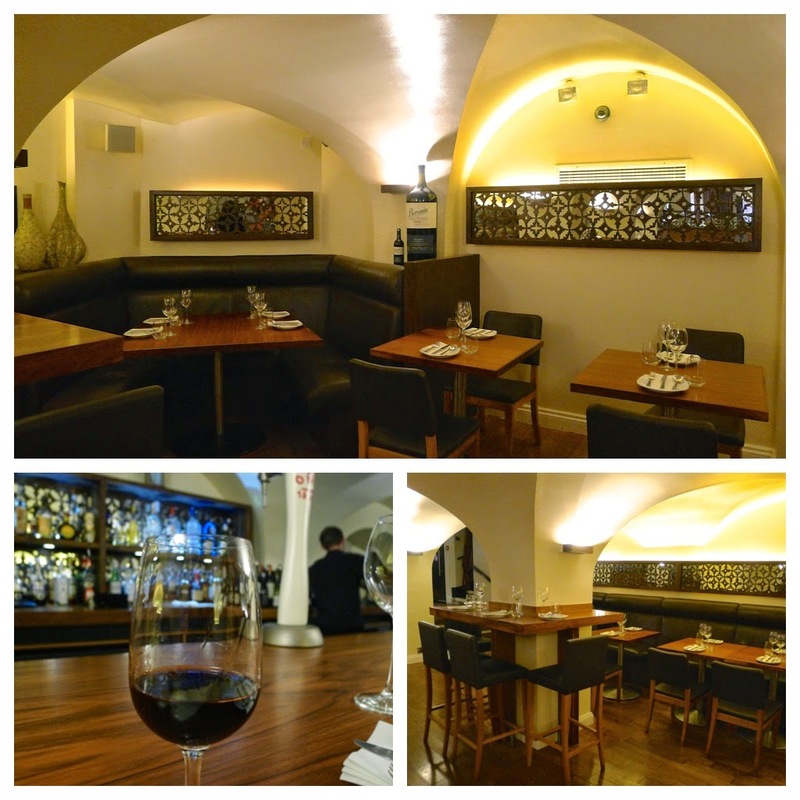 You can choose to sit at the bar or in one of the various nooks and crannies afforded by the vaulted ceilings. Seeking a more authentic tapas experience, we chose the bar. 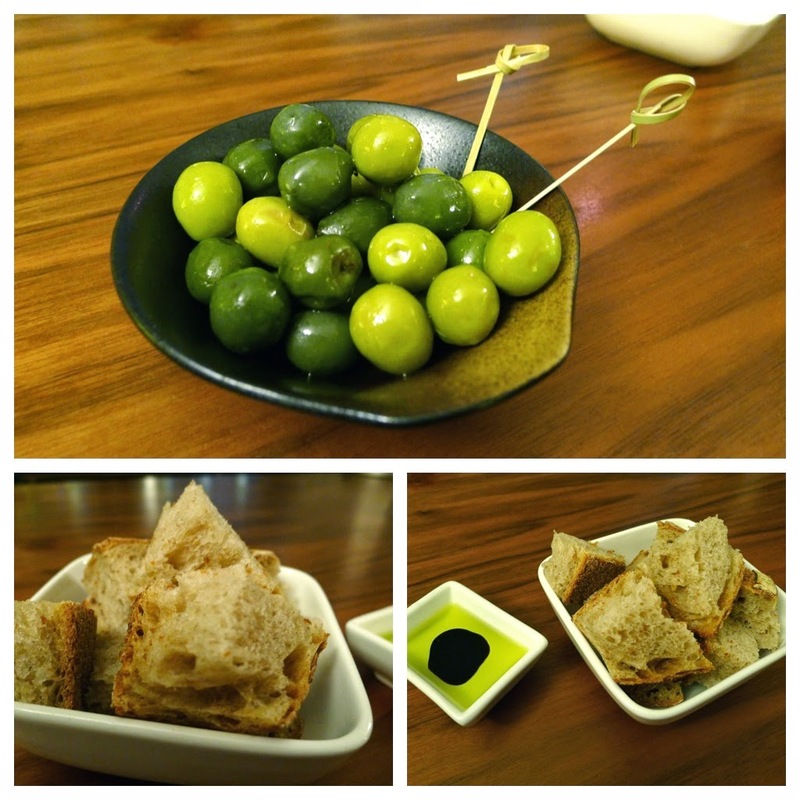 Marinated mixed olives – Manzanilla and Gordal varieties. 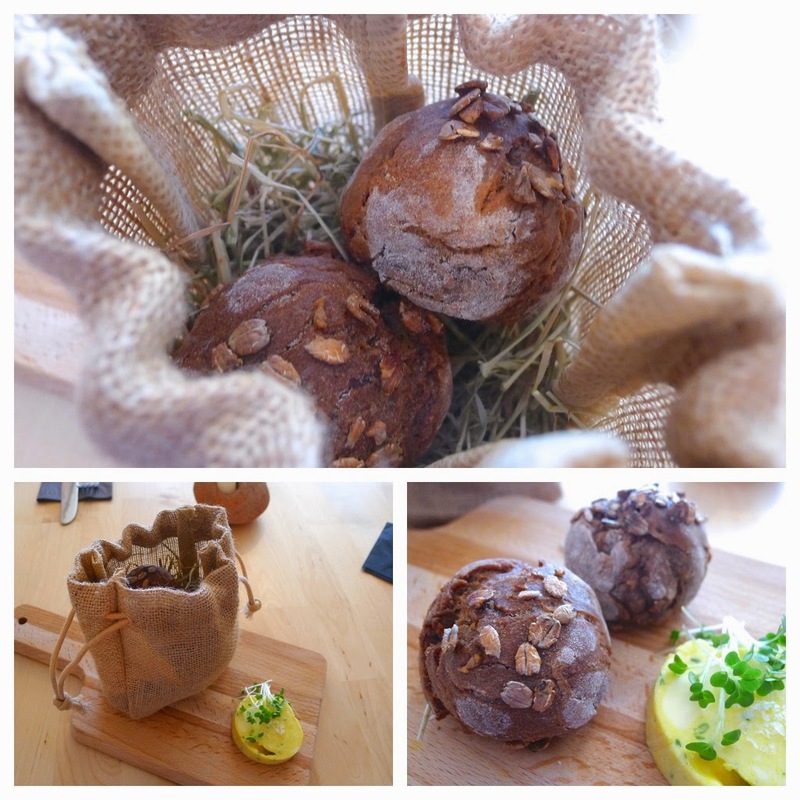 Sourdough Bread, Arbequina olive oil and balsamic – great bread, quality oil. 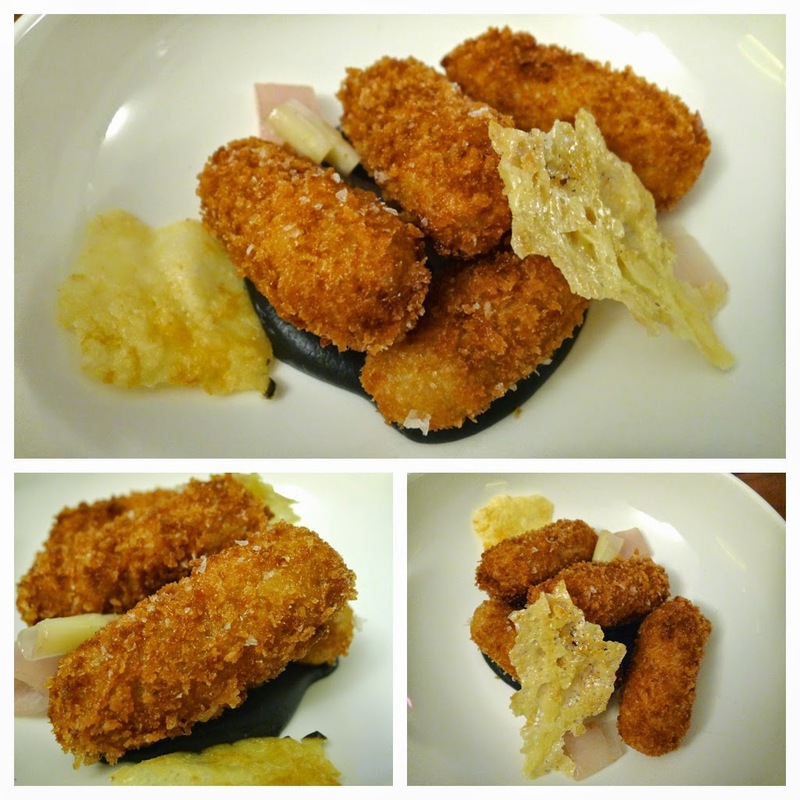 Jamón Croquetas, burnt aubergine, Manchego – with a delightfully crisp coating, containing a generous amount of ham and a dreamily thick béchamel, these were the best croquetas I’ve had. The burnt aubergine cream and sharp shallots added an interesting dimension to the dish; although, nice through they were, I found the Manchego wafers a little too strong to compliment. Paleta Ibérico de Bollota Reserva D.O. – the ham was sensational. 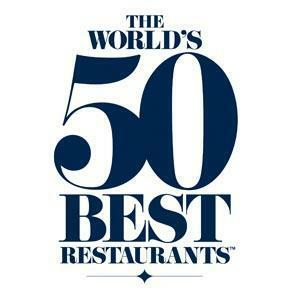 Worth every penny of the £15.95 paid for the portion – credit to the restaurant for selecting such quality. 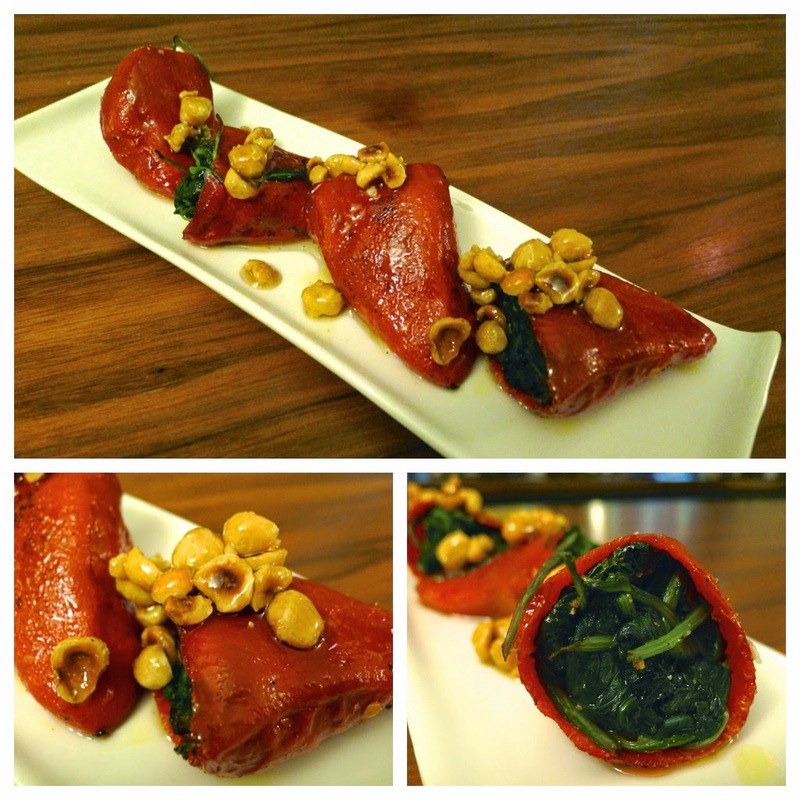 Goats cheese stuffed Piquillo Peppers, spinach, hazelnut honey – a good dish, I love the combination of cheese, honey and hazelnuts. Mushroom Carpaccio, truffle oil and pickled mooli – a lovely way to serve mushrooms. The little discs of pickled mooli were a great addition. 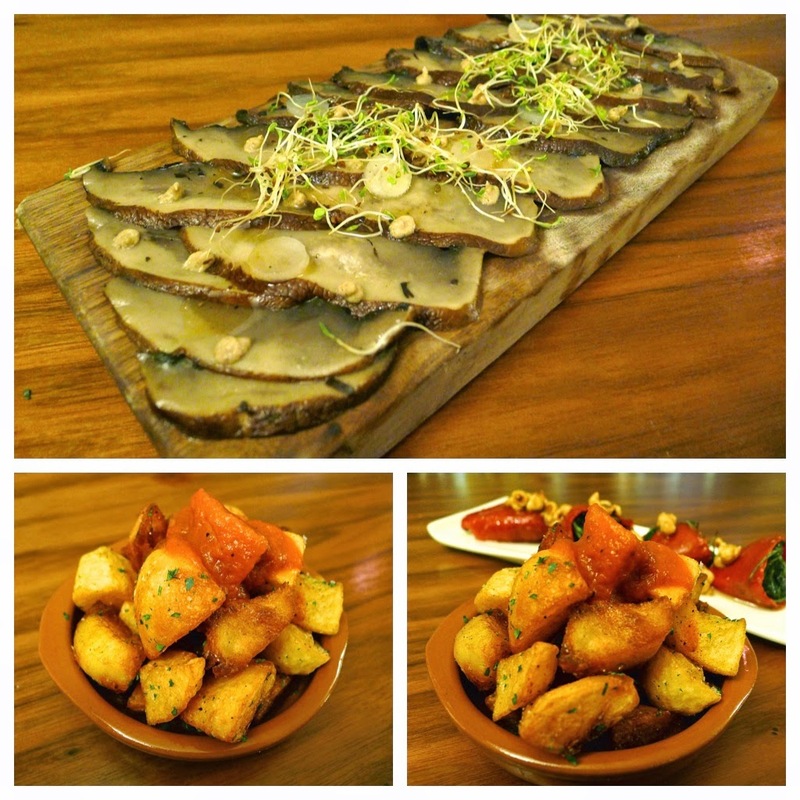 Triple Cooked Patatas Bravas – cooked in goose fat. As good as they sound. 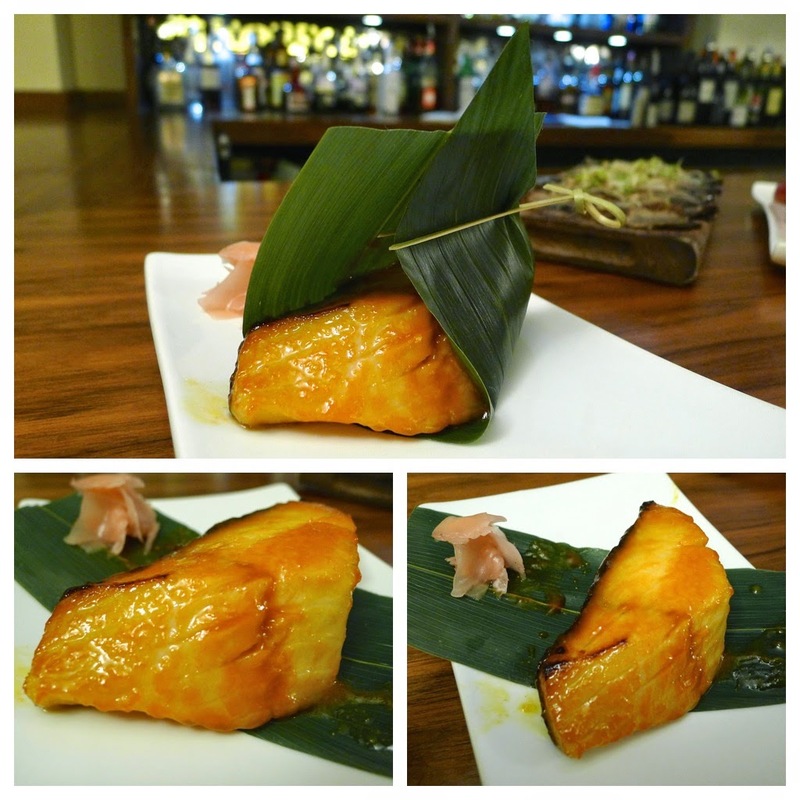 Black Cod – as stated on the menu, ‘line caught, sustainable Alaskan Sablefish (black cod) is a richly flavoured dish with a high Omega 3 oil content and satiny texture. 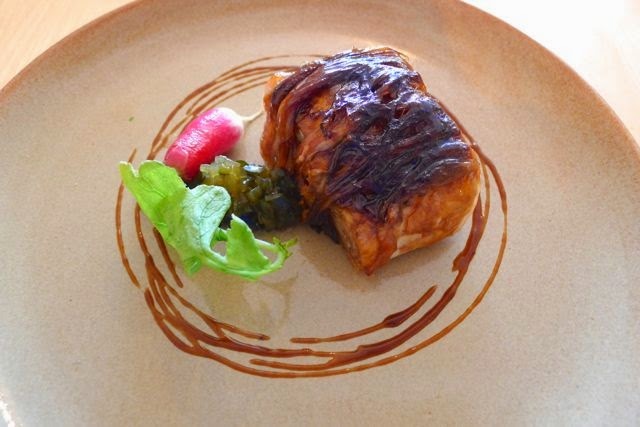 Marinated in a spicy miso for 36 hours’ – a dish made famous by Nobu, this best highlights their concept of ‘world’ tapas. 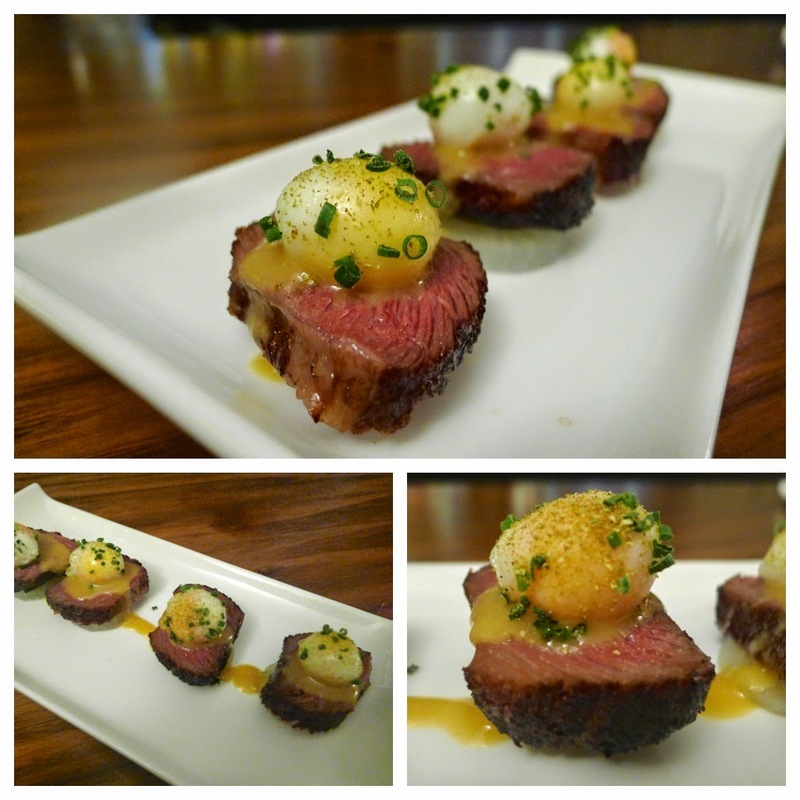 Slow Cooked Beef Short Rib, pickled mooli, soft poached quails egg, miso butter – also making good use of Asian flavours: another disc of pickled mooli, topped with an umami hit from the meat and miso with the indulgence of butter and runny yolk; another top dish. Churros & Hot Chocolate – in my experience, churros always taste better when eaten in the sunshine and with a silky, rich chocolate sauce and a good coating of cinnamon sugar, the sunshine was all that was missing. 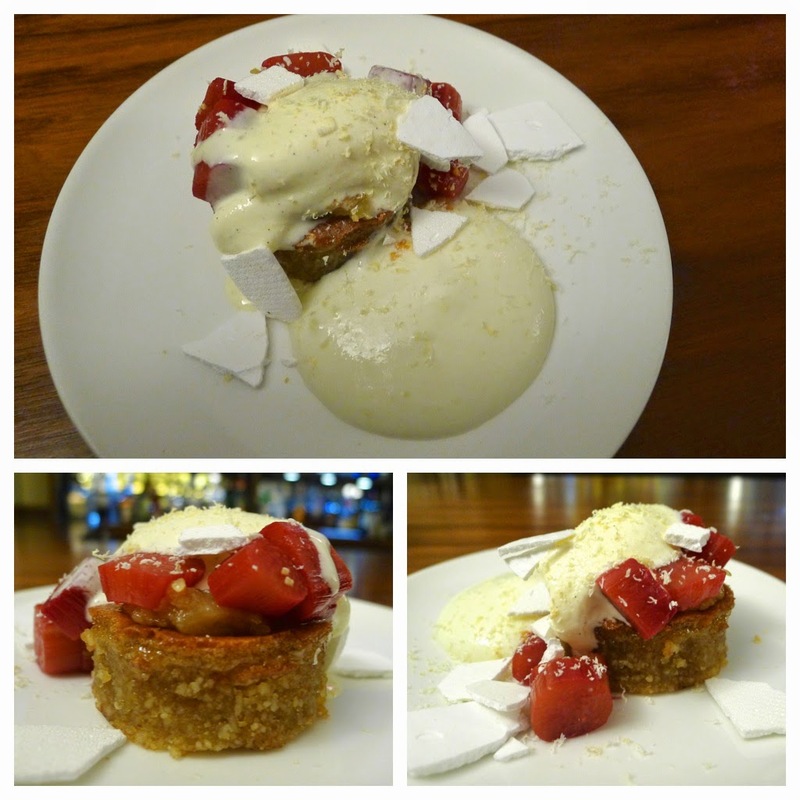 Olive Oil Sponge, lemon, rhubarb – a beautifully balanced flavour combination featuring a dense, peppery olive oil cake with a light lemon espuma and sharp fruits. 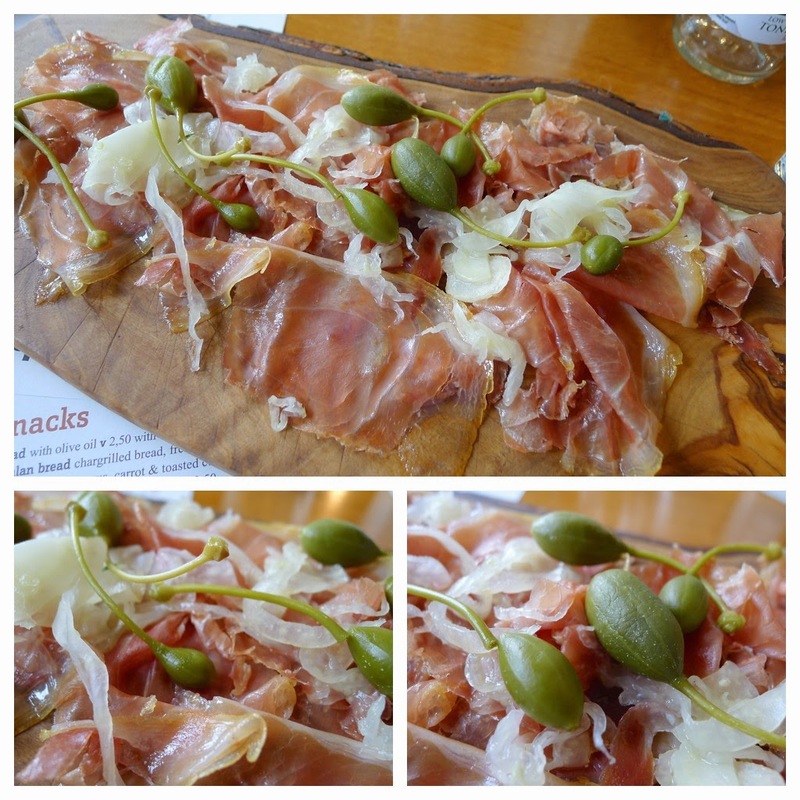 We were very impressed – definitely one of the best tapas experiences we’ve had outside of Spain.